The Rhone wine area is fairly wide, extending from the South of Lyon to the North of Marseille and representing the second largest French wine region. For many French people, the Rhone valley is also synonymous to holiday, as most travelers heading to the French riviera cross the region. Besides its beautiful landscape, Rhone is the home of several well-known grape types such as Viognier, Roussanne, Grenache and Syrah. 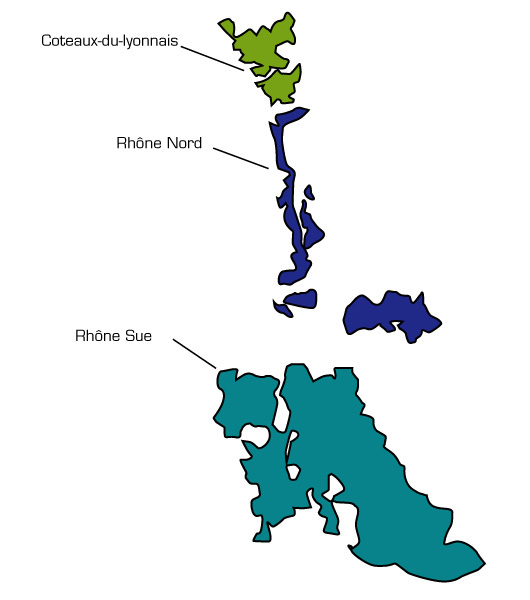 The Rhone region is an upcoming area for wine, especially seen from an American perspective. The climate produces wine with a good structure and a higher degrees of alcohol, which remind many consumers of wines from the West Coast of the US. The Rhone valley wines also have the benefit of being excellent as a young wine as well as posessing great aging capacity. I am particularly a fan of the south Rhone wines, which have improved tremendously over the last 15 years. Appellations such as Vacqueyras, Rasteau or Cotes du Rhone Seguret and Plan de Dieu make amazing wines, which are still very affordable compared with their neighboring regions further south in Chateauneuf du Pape.